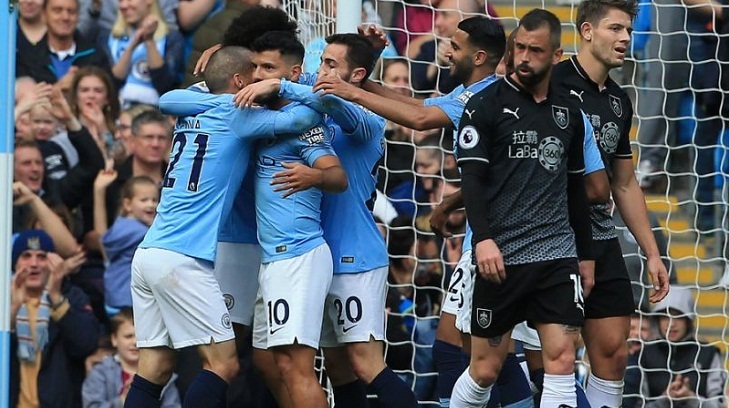 City's win gives them a two-point cushion over Chelsea and Tottenham -- 1-0 winners at West Ham -- but Liverpool will join them on 23 points if they beat Huddersfield in the late kick-off. Pep Guardiola's side, who missed a late penalty to beat Liverpool at Anfield earlier this month, made it seven wins from nine league games as Burnley goalkeeper Joe Hart endured a miserable return to his former club at the Etihad. Earlier, Ross Barkley scored in the sixth minute of injury time at Stamford Bridge to level the match at 2-2 after Anthony Martial had scored twice in the second half to cancel out Antonio Rudiger's opener. Mourinho took exception to the celebrations of one of Chelsea's backroom staff, Marco Ianni, who ran in front of the Portuguese on the touchline, as he seemed set for a desperately needed win. "(It was) not celebrations, but bad education. But I also made mistakes in football matches and I will make more so after the game when he came to offer his apologies, I accept," added Mourinho. The United boss, who has a tough run of fixtures coming up, including games against Juventus and Manchester City, described the 2-2 draw as an "awful" result for his team, who roared back from 2-0 to beat Newcastle United in their last match. "I am happy with the performance of the team for 60 minutes because for 60 minutes we played our football," said the Italian. "Then after the goal of 1-1 we haven't played our football. We only played the long ball and we are not organised to go on the second ball."